Property 51: Villa Angelika - just a 2-minute walk away from Gaios waterfront. 2 bedroom villa with a pool and sea views. Property 57: 2 bedroom villa with a pool and sea views. Property 72: Spacious character house with pool. Restful environment. Pericles .... a true home from home. Property 82: Pericles .... a true home from home. 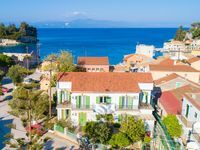 Property 94: Poppy Apartment - one bedroom with dramatic views over the bay of Loggos.